"This is poetry of big love, great heart. George Venn's scale is immense and inclusive... The only other poet I know whose work has such range is Tom McGrath who, like George Venn, told the stories of his region in such a way as to make them magical, luminous, and permanent..."
"In West of Paradise George Venn covers the territory from aluminum foil-covered coffee cans full of flowers at grave sites to emperor penguins carrying their eggs on the tops of their feet. Whether dealing with the Colfax Grade or the great undulations of the Palouse, he is a master of the detail that exudes the spirit of place, of time, of the hopes and joys of the human soul." 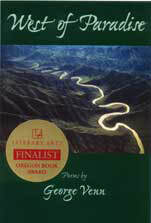 "West of Paradise conjures the rural Northwest's colorful characters and the hard-edged codes they live by... Here, too, are the places we love--Hells Canyon, the Wallowas, the Imnaha River--all carved knifeblade sharp. Once again, George Venn offers a collection to treasure."